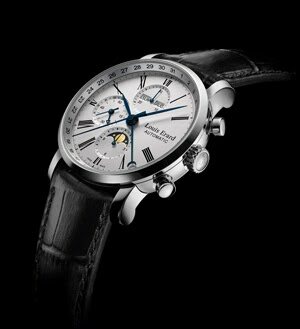 A technically and aesthetically flawless interpretation of time according to Louis Erard, the Excellence collection embodies the delicate balance of the traditional and the contemporary in watchmaking. Sobriety defines this chronograph in versions for men and women. A classic, elegant interpretation that displays moon phases at 6 o'clock and the date by a central hand, with small seconds sharing its dial with a 24-hour indicator. Or a precious, refined version with deliberately fewer functions and softer, eminently feminine roundness.